Yes, we do! 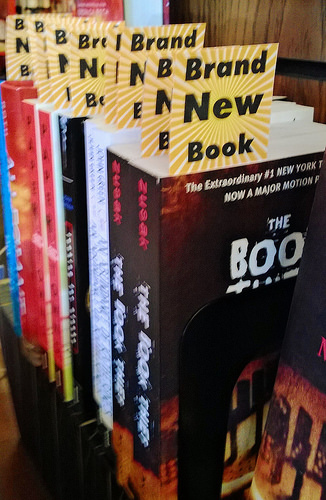 Bookmans now carries brand spankin’ new copies of your favorite, high-demand books. While we bibliophiles love the smell of old books, the thrill of cracking open a brand new edition is an unrivaled experience. Check our shelves and displays regularly as we update them daily. Come see what we have for you now. Don’t worry. We aren’t switching to new all-together. Far from it! We still buy, sell and trade mostly used merchandise. All this means is that when the next big title from your favorite writer comes out, you don’t have to wait for someone to trade it in before getting a copy. This is an exciting adventure with new books! If you have any suggestions on items you would like to see in our store, feel free to make a request! You need a copy of this local author’s children’s book – “Two!” – a funny little board book about what it’s like to spend the day with a two-year-old!